I'm in a van full Belgians, driving through the Belgian countryside, in order to see the Tour of Flanders go by for the fifth time. I quickly learn that the locals pride themselves in knowing routes and strategic locations which will allow them to see the race go by as many times as possible. As we drive and eat stale sandwiches, we start discussing the many signs and flags that you commonly see in races like this. 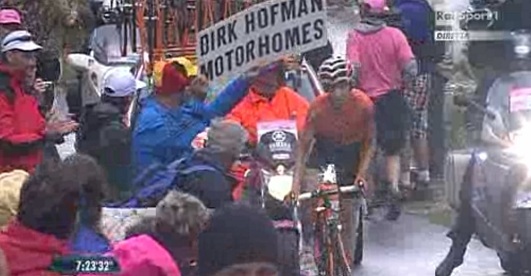 The Dirk Hoffman Motorhomes sign, Tornado Tom Frits and the like. I weigh in with my favorite. One that is not spotted as often, but is far more inventive. The Ned Flanders flag. The moment I say that the flag in questions features Ned Flanders from the Simpsons, I get blank stares from everyone in the van. What do the Simpsons have to do with bike racing? So I explain that the character's last name in English is Flanders, like the region and the race. The blank stares turn to flinty squints, until one gets it, and then another. "Ah yeah!" one says. But it's obvious that the pun/joke didn't hit them as it hit me when I first saw it. Their slow reaction aside has done little to dull my feelings about the flag. As such, it has remained a favorite flag of mine in cycling (I have written about others in the past) to the point I have managed to find the owner and creator of said flag. A flag so important, that none other than cycling empresario and commentator Mike Spriggs once opined that "it should be in the damn Smithsonian!" You may not know who she is. But if you've noticed the rise in quality of Colombian riders at the World Tour level (Quintana, Chaves, Pantano, Atapuma, Henao), you should know that Luisa Fernanda Rios played a crucial part in the development of those riders, and in the current state of Colombian cycling at the highest level. As general manager of the Manzana Postobon team (previously Colombia Es Pasion and 4-72 Colombia), Luisa Fernanda oversaw the development of all the riders I just mentioned. Plus many others. She's been a constant and important presence in the Colombian peloton, guiding her team through countless setbacks with a positive outlook that is admirable. Luisa Fernanda came to the Manzana Postobon team as its general manager nine years ago, in large part because she was a complete outsider to the sport. Something that Colombia Es Pasion directors were looking for, as they felt disheartened by the status of Colombian cycling. Now, backed by the largest soft drink maker in Colombia, Manzana Postobon has been invited to this year's Vuelta a España. I spoke with Luisa Fernanda to understand what this means for the sponsor, the team, and ultimately, a country. In terms of what they believe and care about, cycling fans commonly stand in one of two sides of a great divide. I sometimes pretend that I’m in one side. But there’s proof in my hard drive that I'm not. I have an Excel spreadsheet on my computer, which contains methodically calculated (not by me) watt/per kilo figures for riders at the Vuelta a Colombia. I’ve only looked at the file a handful of times. When I do, I feel much as I did when I was kid in Bogota…when I would try to see if the refrigerator light would stay once its door was closed. I tried to solve that great mystery (I was five years old at the time). How did this thing work? To that end, I would close the refrigerator door very slowly, squinting to see if the light went out in the process. Eventually, of course, I found the spring-loaded switch that made the light to come on or go off as the door moved. I quickly realized the light did in fact go out when the door was closed. There was no mystery. What’s more, I realized that I could make it go on or off at will. Anyone could. Finding that switch made the avocado-green refrigerator loose much of its mystique. At times, that Excel file has the same effect on me now. I always ask endless questions of foreigners who visit the Colombia. The latest person to endure such a grilling is Kyle Murphy, from the Jamis-Sutter Home team. Along with his team, he competed in the last Vuelta a Colombia, and he was kind enough to share his insights into the race, Colombian cyclists, local food and the value of mayonnaise. During a sizable part of the 20th century, trade restrictions left Colombia largely isolated from the rest of the world. This included its bike industry, which was forced to come up with creative solutions that say plenty about a nation's ingenuity and its love for the bike. Today, as markets have opened up, Colombia's bike industry is in flux once again, and Colombian companies are having to change with the times.